"This is a Total outrage.I am not a human right activist.I don't even know what it certs to be that.but, I am human.and, it is my human right to state things i think is humanly wrong.and this one is. @charlizeafrica you really need to take that kid back to where you got him from or stop dressing him this way. (1)he is an underage. 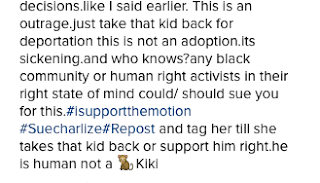 (2)he is black.remember the history?yea you right.i doubt any black person would appreciate this.cause to me,this is something like a broad day slavery. 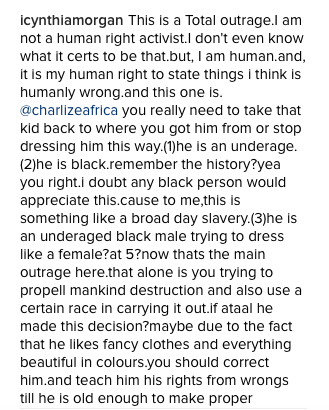 (3)he is an underaged black male trying to dress like a female?at 5?now thats the main outrage here.that alone is you trying to propell mankind destruction and also use a certain race in carrying it out.if ataal he made this decision?maybe due to the fact that he likes fancy clothes and everything beautiful in colours.you should correct him.and teach him his rights from wrongs till he is old enough to make proper decisions.like I said earlier. 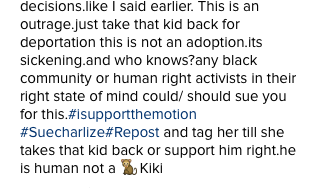 This is an outrage.just take that kid back for deportation this is not an adoption.its sickening.and who knows?any black community or human right activists in their right state of mind could/ should sue you for this.#isupportthemotion#Suecharlize#Repost and tag her till she takes that kid back or support him right.he is human not a 🐒Kiki"